The original University Hall, which stood until 1938, when it was replaced by Gregory Hall and the Illini Union. Pieces were used in the erection of Hallene Gateway dedicated in 1998. The university hosts the National Center for Supercomputing Applications (NCSA), which created Mosaic, the first graphical Web browser, the foundation upon which the former Netscape was based on and Mozilla Firefox and Microsoft Internet Explorer are based, the Apache HTTP server, and NCSA Telnet. The Parallel@Illinois program hosts several programs in parallel computing, including the Universal Parallel Computing Research Center. The university contracted with Cray to build the National Science Foundation-funded supercomputer Blue Waters The system also boasts the largest public online storage system in the world with more than 25 petabytes of usable space. The university celebrated January 12, 1997 as the "birthday" of HAL 9000, the fictional supercomputer from the novel and film 2001: A Space Odyssey; in both works, HAL credits "Urbana, Illinois" as his place of operational origin. ^ "Columbia Missourian — Tradition's beginnings mysterious". Archived from the original on October 24, 2006. 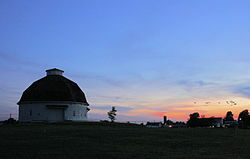 Wikimedia Commons has media related to University of Illinois at Urbana-Champaign.